Paradise Island 9A-Sunrise Beach Club-Beachfront-Affordable!! Villa, 2 Bedrooms, 2 Baths (Sleeps 3-6)-beachfront-ocean view! This Sunrise Beach Villa is a unique location on Paradise Island. at Homeaway, #273412 and #361431. All have ocean view and have 2 bedrooms, 2 bathrooms. Sunrise Beach Resort has private villas alongside Sunrise Beach Hotel, which means you have access to a restaurant and bar onsite. There is live music available onsite at Violas, the bar. Many people visit here for family getaways, honeymoons or weddings. Simply fly to Nassau, catch a taxi and you are at Sunrise in 20mins. You have no need to rent a car. You can get groceries online,delivered to your villa or in local grocery store. There are 2 pools at this property and walk onto beach in seconds. Why stay at Sunrise Beach? : The biggest decision when traveling is whether the people we book for will be happy with our choice. The trepidation of this has been palpable for me personally. I sincerely believe you will be thrilled in your decision. Choosing over the internet is a draining process with so many choices. Being a large family we have chosen this location because of what one need to achieve-good access to fun things to do, safe, clean, food readily available and easy beach access. A tranquil environment allows relaxation and connectivity within a family. Advantages of booking at Sunrise Beach: Please do not waste countless hours emailing and calling other properties. Book here today, book your flight to Nassau and you are on a most spectacular island with no need to rent a car at peace with the sound of the ocean enveloping you. Access to Atlantis and why to book at Sunrise: Atlantis is an expensive destination to stay at- extra charges add up to 18% on top of booking rate. The cost of meals to feed a family is prohibitive. Having your own place to prepare Come and stay at Sunrise beach, the affordable choice. We offer the best value and have the added benefit of internet and long distance available at no charge. long so all the amenities are within walking distance. You are located one property away from Atlantis-closer to the main part of Atlantis than Atlantis visitors, who need to take a shuttle to where you can go. You are next door to the One and Only Ocean Club. Downtown Nassau is a colonial city with lots of interesting things to do and see. Paradise Island has a beach side, where we are located and the harbour side a few minutes walk away. We provide very comfortable villas on Paradise Island and provide long distance calls without charge to home, as well as free internet service. All places have LCD Tvs, in living room and each bedroom. All villas have central air conditioning. To access Atlantis simply buy passes at Atlantis if going on watersides. Access to casino and restaurants naturally has no cost. Sunrise Beach Resort Hotel is on the same site as us and has earned very high ratings. We rent independently to our guests however to provide the most affordable rates. If you book last minute a special discount applies and if you book 2 or more places for the same time a 10% discount applies off nightly rate. We have a final cleaning cost of $65. We look forward to welcoming you to Paradise Island and our Sunrise Beach Villas. If your choice of timing is not available please email as the others may be available. Family with 4 children -chose to visit the Bahamas 10years ago and bought our first home 5 minutes from this location -listed on vrbo #1290 acquired 2 more at this location 2 bedrooms and then added to our list of homes 3 2 bedrooms at the beach (Sunrise) we find the range we have helps visitors get the best choice for their vacation we have repeat visitors and the Bahamas has excellent weather, food , spectacular beachfronts as well as warm hospitable people. The best about the Bahamas is the accessibility and colonial charm. Great location-at Sunrise Beach- no need to rent a car, close to airport, quick connections. You are on the beach and this is unique for Paradise Island. Peaceful , affordable, no surprises in cost. You can prepare food readily and save money to do the activities you wish to do. Compare hotel costs on Paradise Island and you will want to book today! We have many repeat visitors and please secure your timing early. We have 4 locations to rent- so you can have a large family gathering. The environment is inspired by Austrian chalet architecture. That is why you will see unique design. Never cold enough for heating! Cable Internet- cable modem and wifi router in villa. Spacious dining area , right next to great kitchen. sit outside and relax -see the ocean from here! 2 pools on property in the section you are in you can swim and see the ocean from villa and when in pool. Never overcrowded. 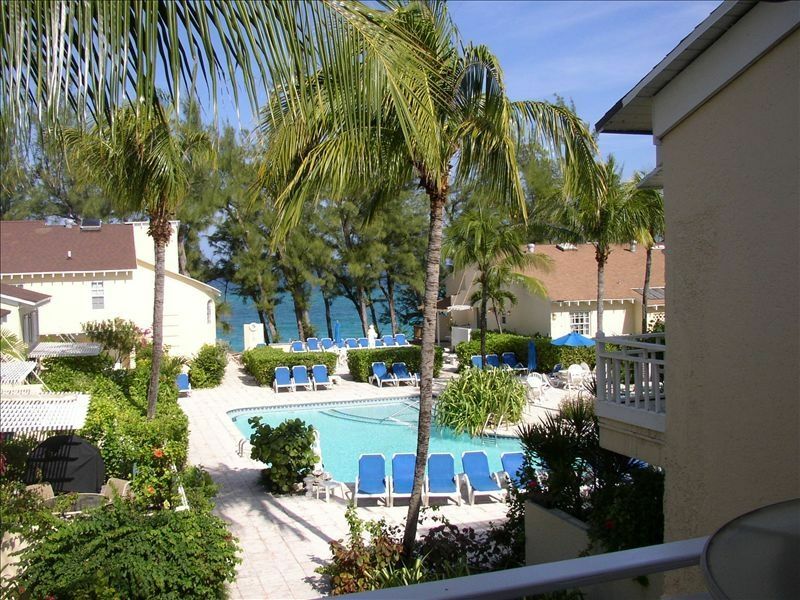 Completely renovated in 2007, this two bedroom beachfront vacation rental overlooks the swimming pool to the sea beyond, with Direct beach access. Located on world famous Paradise Island and just a short walk to Atlantis, this property combines the beauty of the beach by day with an array of restaurants, night clubs and a casino for entertainment by night. Prices -new launch pricing. Compare with Hotel Prices. No additional taxes or surcharges! Book now to save! Private beach area. Easy walking distance to Atlantis and all of the shops. Viola’s restaurant right on property was excellent. Highly recommend! Mike, thank you for your positive comments. We appreciate them. we are delighted when our guests have a good time. highly recommended! stay here every year! John is great to work with! his apts are all great! he has a great team working for him in the bahamas if you do have an issue. highly recommended! I brought my 3 daughters to paradise island for a girls Getaway. Sunrise Beach 9A was perfect. The place was great! Plenty of room with all the amenities needed for a comfortable stay. The beds were comfortable, and the view was amazing. The manager, Dianna, was very helpful and quick to respond when needed. We didn’t want to leave and we will be back! Place was Clean, but upkeep is not that great. Electronic lock is on timer and will not work until EXACTLY 3pm checkin. Do not tell you that, so I thought the code was incorrect. Get a car! Ignore the comment about not needing a car. Getting food was HARD and getting around without a car was a hassle. Beach is full of cruise ship people, noisy, not relaxing at all. Water is beautiful. Best part of beach was farther down away from the noise and crowd of the cruise ship beach that carried over to “our” beach. Could rarely get an umbrella, only 5 for the whole complex. Hawkers dragging I’ve rusty trashy chairs over for the cruisers. Cruise ships have ruined all of Nassau, outside of small area around ships and Paradise Island, Nassau is boarded up and suffering. Locals seemed annoyed and were thus not very friendly. Place was ok, but the trip was a sad disappointment. Thank you for your objective comments. When several issues arise it does create disappointment. Have asked management to supply more umbrellas. On the beach there are exclusive loungers and umbrellas just for our resort and one other- not for cruise ship visitors. We have visited for 20 years and never bothered with a car rental. There is a free shuttle available to bring you back and forth to a nearby large grocery store. Our villa has been fully painted recently and has a spectacular view that visitors rebook to enjoy again. The code is auto programmed but if requested we can provide earlier access- we do this so cleaning can be completed. On occasions vendors may be present. It is good you got to a quieter section of the beach - because we have Loungers on the beach it does limit crowds there. I am sorry you did not have an exceptional experience and all of these irritants can add up. Local Bahamians are typically friendly and warm. Some who are trying to sell something like anywhere in the world can be challenging. The beach attendants typically limit that aspect. We take note of all comments and endeavour to rectify what we possibly can. "Will work on getting some more umbrellas and tables as soon as possible." We work to address issues as soon as informed. This is an excerpt of review received same week for same vicinity: " The property is perfectly located, quiet and as advertised!" We hope to ensure a wonderful time is achieved by all. This was the best place to stay on Paradise Island. Located right on the beach, two swimming pools, an easy 2 block stroll to Atlantis and the unit was perfect for a family of three plus grandma. A balcony that looks over the ocean and the pool, a restaurant right on the premises and security coded gates from the beach made this the perfect place away from the chaos but close enough to enjoy the casino and the water park. We are not hotel people and we do a beach vacation every year.John provided us with all the information we needed for ground transportation, grocery delivery, and door/gate codes ahead of time. Booking the unit was easy and we really enjoyed our stay. Thanks for a wonderful vacation! We've stayed at sunrise villas a number of times. Perfect location, and very convenient. Delighted you had a good time. Thank you! The Bahamas itself is relaxing to visit and having access to such a unique property will be reinvigorating for the whole family. A large busy hotel is not all that relaxing and very overwhelming. However when you want to access Atlantis that is easily achieved- the casino, beach and restaurants are open always. An Aquaventure pass allows full access to Atlantis grounds and the water slides -which are exhilarating. A tour of Atlantis pass is just that- a tour of the grounds, which are out of this world. Our favourite time to visit is at night. Cabbage beach -the beach at you doorstep is one of the most breathtaking views in the world. The turquoise ocean and heaped sand , uncrowded at the Sunrise stretch is a remarkable vista. No need to rent a car-these rates match today's economic reality!! Hotel quality furnishings-very relaxing. Great decor! We have other locations to rent from here - 3 2 bedrooms and 1 3 bedroom if you are booking 2 or more places at the same time 10% discount applies off nightly rate great for family booking. Repeat visitors ask for your repeat visitor discount!